No maximum time limit on rental (Minimum 3 month commitment applies). 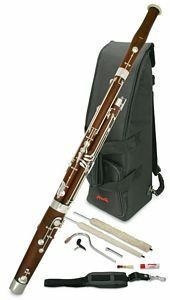 Our low cost Bassoon rental scheme is designed to get you started with the best possible instrument so playing is easier and more fun! When you rent a bassoon, you get a case, reed and cleaning equipment; in fact everything you need to get started. We even get our Woodwind Repairs workshop to check everything fully and play test the instrument before it comes to you. Our rental scheme is run on a monthly direct debit which is set up online via GoCardless. There is a minimum rental commitment of 3 months. After this point you can either keep on renting and paying monthly, or return the instrument to us. If you carry on renting we save half of each monthly payment from month 4 onwards, and you can use this in the future towards the cost of a replacement instrument. The rental instrument always comes back to us, i.e. you're not buying that one, but you can use your credit at any time towards a new or second hand instrument to own. Any questions? Please contact us for more information, or call us on 01628 630800. We have added a short video to explain how our rental scheme works. When starting any musical instrument you need a quality piece of kit to help you progress, a poor quality instrument can really cause an obstruction to progress. The Bassoons we rent are all quality Instruments which have been checked by our Workshop. Please note: Instruments can only be delivered to your UK home address. We will contact you before despatch as part of our security checks. Please ensure we have suitable contact details. Dawkes Music warrants that the Goods shall be of satisfactory quality and fit for purpose. In the event that you believe this not to be the case, you must inform Dawkes Music Ltd immediately so that an examination of the Goods may be carried out, and if necessary, any repairs or adjustments made. Any repairs or adjustments must be carried out by Dawkes Music Ltd or its chosen agent. You agree to indemnify Dawkes Music Ltd from any loss or damage should you fail to comply with paragraphs 1 and 2 above. During the duration of the Agreement, the Goods remain the property of Dawkes Music Ltd.
You are not permitted to treat the Goods as your own whatsoever. In particular you are not permitted to sell, hire, lend or in any way deal with or dispose of the Goods. During the duration of the Agreement the risk in the Goods shall pass to you and you shall inform Dawkes Music Ltd immediately should any loss or damage occur in respect of the Goods. An initial payment is payable upon accepting the Agreement and thereafter the rental charge is payable by way of monthly direct debit on the 20th of each month. In the event that a monthly payment is not honoured, the Goods must be returned to Dawkes Music Ltd. The Agreement is for a minimum period of 3 months (the "Initial Period"). After this period the Agreement may be terminated but only once the Goods have been returned to Dawkes Music Ltd. Following completion of the Initial Period, half of all payments made from month 4 onwards can be used towards the cost of a new instrument. Dawkes Music Ltd reserves the right to commence legal proceedings against you in respect of any breach of the Agreement. The costs associated with any such legal proceedings will be met by you. When taking out an instrument rental contract with Dawkes Music we reserve the right to contact you via the email address provided to provide relevant financial information about your rental contract. The contract between Dawkes Music and the Rental Customer forms the legal basis for us to send periodic relevant email communications regarding your rental contract with us. These emails are not part of our standard marketing communications, they serve to inform you about your rental contract details only. We fully respect the privacy of all customers and should you wish to Opt-Out of receiving these Rental email communications please contact us via accounts@dawkes.co.uk or on the telephone: 01628 630 800. We will then implement other methods to contact you regarding your rental contract with Dawkes Music.